Challenge: Create a stylized trans-femoral prosthesis based on the visual language of the Land Rover brand, specifically the LR3. Process: To start this project I immersed myself in three distinct categories. First, the anatomical study of the human leg provided me with an understanding of the function the prosthesis is meant to replicate. It also provided form direction that encouraged bilateral symmetry. Second, primary research such as amputee interviews guided the design in terms of technical and functional requirements. Third, a study of the Land Rover form language provided the design with a material palette, form detail resolution, and branding. After numerous conceptual iterations, the final design was refined and then rendered with SolidWorks. Challenge: Design, SLA print, and produce multiple resin castings of a toothbrush holder with a volume of less than one cubic inch. Process: This project was completed for the industrial design program at Carnegie Mellon University during the junior year studio. 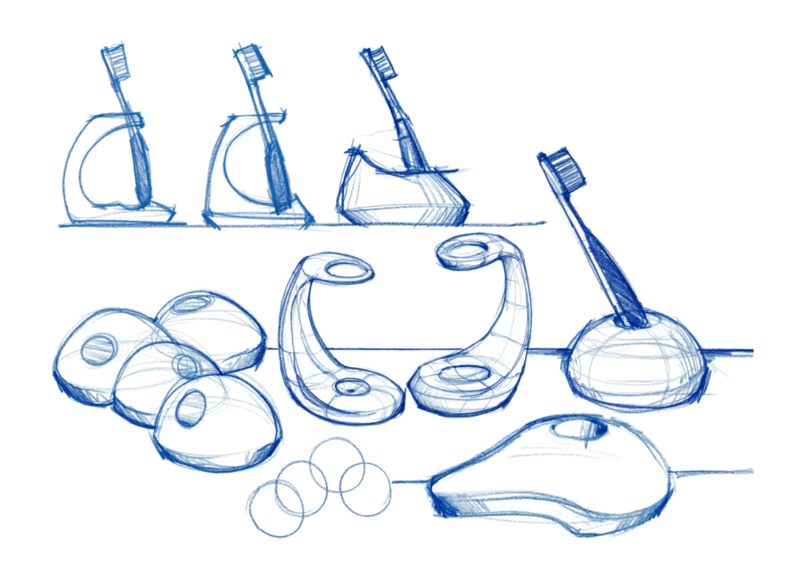 I started with rapid ideation sketching that quickly resolved the design into a smaller, simpler form due to the volume constrain as well as compatibility with a two part mold. The piece is design to be whimsical and heartwarming storage for a group of toothbrushes, especially for families. The soft contours and magnetically linked hugging profile gives the users a subtle reminder of the connections in their life.